As an ETRON Technology distributor, NAC offers customers DRAM & SDRAM memory solutions for industrial, automotive, and consumer sectors. 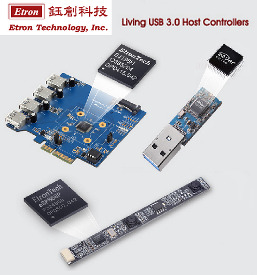 Etron is a world-class fabless IC design and product company. Etron is a low cost leader well known in the Memory industry. The company offers cutting-edge Known-Good-Die (KGD) and packaged ICs, which cover SDR DRAM, DDR1, DDR2, Low Power SDRAM (Mobile SDRAM), Low Power DDR 1 (Mobile DDR1) and system chips. Etron's premium quality products are widely used in various emerging applications, such as storage device, display, handset, PDA, and multimedia device. Etron has kept the flexibility, agility and product focus of a fabless IC company by establishing strong partnerships with leading foundries and companies from different specialty segments. Legacy SDRAM is ideal for “legacy” designs that don’t require the higher data rates or densities that come with DDR 1, DDR2 and DDR 3 technologies. SDRAM is a stream-lined design architecture with a proven track record of performance. SDRAM also has less susceptibility to the pricing swings that leading edge technologies have. SDRAM has all the bugs worked of the designs out and most designs are pin-for-pin, drop in replacements following JEDEC standards. Compared to (SDR) SDRAM, the DDR SDRAM interface makes higher transfer rates possible by controlling of the timing of the electrical data and clock signals. Implementation of DDR 2 often requires the use of phase-lock loops (PLL) and self-calibration to reach the required timing accuracy. The interface uses “double pumping” (transferring data on both the rising and falling edges of the clock signal) which lowers the clock frequency. Keeping the clock frequency down reduces the signal integrity requirements on the circuit board connecting the memory to the controller. The name "double data rate" refers to the fact that a DDR SDRAM with a certain clock frequency achieves nearly twice the band-width of a single data rate (SDR) SDRAM running at the same clock frequency, due to this double pumping. DDR2 SDRAM is a double data rate synchronous dynamic random access memory interface. It supersedes the original DDR SDRAM specification and the two are not compatible. In addition to double pumping the data bus as in DDR SDRAM (transferring data on the rising and falling edges of the bus clock signal), DDR2 allows higher bus speed and requires lower power by running the internal clock at one quarter the speed of the data bus. The two factors combine to require a total of 4 data transfers per internal clock cycle. DDR2 runs at lower voltages and therefore draws less power, making it more efficient by extending battery life and reducing power consumption. Mobile DRAM is type of memory designed for use in mobile (hand-held) electronics. While basically compatible with the parent technology (SDRAM or DDR), the memory uses several techniques to reduce overall power consumption. Most significantly, the supply voltage is reduced. Additional savings come from temperature-compensated refresh (DRAM requires refresh less often at low temperatures), partial array self-refresh, and a "deep power down" modes.